No knitting to show today. I have knit about 2 inches on the bottom band of the Drama City skirt (the book is going well) and am getting ready to decrease around for the transition to stockinette. So in lieu of knitting photos, here is the first bloom in my raggedy garden. The potted plants are Martha Washington geraniums, said to bloom well in cool weather and headed for compost when it gets hot out. The plant's tag says otherwise. We'll see. Can you tell how crap the pots are from the photo? I can never find nice affordable pots. These actually aren't the worst I've seen. 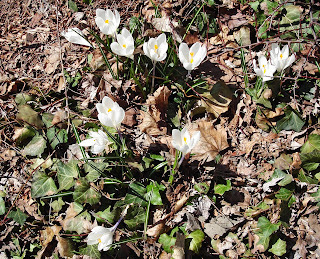 The next photo is crocus. I want to get some more, but you have to order from a specialist to get white, and I only want want white. It's my front garden theme: orange and white. I actively dislike circular needles. I hate that whippy cable. I prefer straight needles and even double pointed needles to circs. I said earlier that I would like to try knitting socks on 2 circs., but I was kidding myself. I'll never try it. In line with hating circular needles, I tend to dislike tubular sweaters as well. All one piece, no seam sweaters seem barrel-like to me; seaming produces a more refined looking fit. Luckily I, unlike most knitters, do not hate seaming at all. I could do it all day. And it produces my finished garment which I am excited to see and wear (or use), assuming it turns out wearable. Also, unlike most knitters, I hate charts. My eyesight is pretty good (with glasses) but charts make me go blind. I prefer words to charts, and, while I do use charts on occasion, I have been known to translate the chart into written directions. I like mindless knitting to a degree. The only part of complex knitting I really like is seeing how the pattern will look. Once I have that established, I find complex patterns just as boring as simple only a lot more stressful. I think Elizabeth Zimmerman is over rated as a guru. She surely does have some clever ideas, some of which are definitely in my future, but I don't like her style. If the above dislike didn't offend you, this one is sure to. I could do without all the abbreviations knitters (and other bloggers) use. LOL strikes me as a little cutsey and DH or DD as a combination of snarky and smarmy. Signing off now. Don't hate me because I'm opinionated. I am grinning and chuckling (would that be GAC? )over this post. You are so frank and I love a woman who speaks her mind. I agree with you on Zimmerman - I'm sure she was a lovely lady - but she doesn't appeal to me either. We part ways on the needle thing. Circs are what I like. What I like best of all is that we all get to choose what works for us.